Like most people who have had their lives untouched by blindness, I had taken the beauty of the everyday for granted. Little things such as seeing my friends, reading a book, watching TV, and simply seeing life in all its simple beauty. It is exactly a year ago today that my view of the world changed, when I realized that I was ignorant of what I had. On the 11th of December, 2009, I helped a blind lady across the road in Cork. The woman was quite young, in her late twenties. Despite her disability she had style, but it was more than that; she had a presence about her. She held her cane as if it was a jewel to be admired. Her look and posture oozed confidence. I was awe struck. I had never genuinely really thought about blind men or women before. I obviously had felt sorry for them and their burden and wished them a better life, and often I would donate a feweuro here and there if I was to pass a charity stall, but that’s as far as it went. Missy was the youngest of five to an average family in west Cork. She has never seen her parents, herself, or anything for that matter. She was born blind. Missy still attended school and finished her degree in social sciences. She said that she used to cry a lot when she was younger; she was jealous of others and was angry at the world for hardships in her life. Her family and herself stopped going to mass and lost faith in religion. I can understand that. She often heard her parents crying at night, wondering about the future for her after they had gone. Her parents and herself each have two jobs to help pay for a new medical treatment for blindness in Ohio. Missy remains doubtful and does not leave herself hope because it is simply too painful if unsuccessful. There were a lot of sad moments she recalled, but there were happy memories too. She reveals she is much closer to her mother than most children; her Mom is actually her best friend. Missy believes she will live with her Mom till the very end. “One day I just stopped feeling sorry for myself and angry at the world,” she told me. “Life opened up another way to me that you can’t possibly imagine.” She told me try it out. That same day, I decided to experience what being blind is actually like for a twenty four hours. I blindfolded myself and promised myself not to untie it till the next day. It was genuinely the most surreal experience I have ever encountered in my life. I felt utterly helpless. I moved at a snail pace to get around my house. Despite my house being a fairly large country house, I felt an unnerving sense of claustrophobia. I tried going to the bathroom, cooking, washing up and household chores, simple things, and I struggled with all of them. I found all my electrical items and books were useless to me now. My iPod and radio were the only source of comfort, as listening to the TV without seeing it was a strange experience. During those few hours I relied on my other senses to cope. Touch and sound felt almost magnified. While eventually I became slightly braver in my movements, I still hopped my shin or my head off every second thing, but I was more confident. I still didn’t dare attempt to go outside. I was actually scared to do so. Inside your own home you feel somewhat in control but outside feels like a death sentence. After about six hours of being temporarily blind, I took off my blindfold. I simply couldn’t hack it. Everything was just too difficult. My food that I ate was actually half raw, my legs were black and blue, and the house was in a bit of a state. Nonetheless the experience was actually a valuable lesson for me, and one that I would encourage people to try out. You understand a lot about yourself in doing so. My respect and awe for Missy and indeed all people who are blind tripled. She is a much stronger person than I am. To have the courage to go outside, be it the city or country is incredible, such little control over what happens and yet they still venture out and are determined to live a normal life. Missy accepts things how they are, she tells me. She is still not comfortable going outside but still does so. She also reveals that she hopes to meet a nice man to settle down with. Despite being young Missy sounded as wise and understanding as a woman twice her age. Missy then rose from her seat, head held high and walked like a queen into the number nine bus, without me even telling her it had arrived. To this day I am still in awe of these people who leave their fear at the door and venture out to the unknown. Missy taught me a valuable lesson that no school or college could teach. So please if you do see someone blind and struggling, ask them if they need a helpful hand. 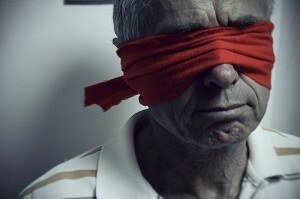 The blind deserve your respect, not your sympathy.